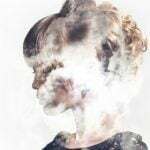 More and more people are trying to drift away from animal products, focusing on a better mind and body, while also giving more attention and importance to animals and the environment. But let’s face it, a lot of ‘meal replacement’ powders out there taste gross, whether they are vegan or not. We’re putting an end to gross protein powders and giving you the top 7 list of vegan meal replacement powders that are not only delicious, but packed to the brink with essential nutrients your body is craving. Completely plant-based and delicious, PowerPoint Superfood Nutritional Shake Powder is a definite must-try. It is loaded up with a whopping 23 grams of protein made from raw Belgium peas and USA organic peanuts. Alongside 5 grams of fiber per serving and 1500 milligrams of raw superfoods, there is also an amazing 500 milligrams of a rare earth calcium that your body can truly benefit from. Every shake is designed with a delicious taste, whether you opt for a delightful chocolate and peanut butter madness to crush sweet cravings, peanut butter bliss for the peanut butter lovers out there, or the vibrant vanilla that creates a sweet and delightful flavor in your mouth. With absolutely no gritty texture, this non-Gmo and vegan meal replacement powder is made without any type of soy, corn, chemicals, preservatives, fillers, artificial sweeteners, or any other disgusting and unwanted ingredients so you know you’re truly getting the best out of your powder. Sun Warrior is undeniably one of the most popular brands out there, and for good reason, too: there products are simply amazing and they taste great too! 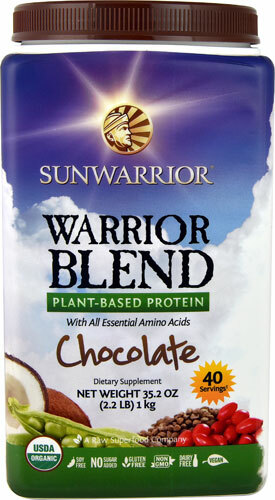 This particular vegan meal replacement powder from Sun Warrior is designed with a succulent chocolate taste that anyone would love to devour. It’s easy to mix in with your favorite beverage and you know you will be getting a powerhouse of nutrients with each and every sip. What’s inside of this outstanding vegan meal replacement powder? Well, let’s take a glance: this powder is uniquely designed to give you the best plant based protein boost from an exciting blend of peas, hemp seeds, and cranberries. Fused altogether, these three nutritional ingredients turn into an incredibly smooth and delicious superfood powder you will adore. Not only can you reap the benefit of these nutrients, but there’s also the addition of coconut oil inside of this powder to create a seriously beautiful powder your body will be thankful to have. There is a WHOLE lot of amazing things packed inside of this delicious tasting vegan protein powder, and the best part is, it can easily be used as a smoothie instead of a usual ‘protein powder’. Add it in to your favorite smoothie recipe to boost the nutrient density AND the taste! What’s inside of this vegan dream come true? Well, the simple answer is: tons. But to get a better look at this powder, let’s check out some of the other amazing ingredients found inside: soybeans, amaranth, quinoa, buckwheat, millet, and chia. All of these combined creates a seriously powerful protein that will give your body a quick boost in all essential nutrients, which means a very happy, energized body that will see you through the entire way and anything that comes your way. 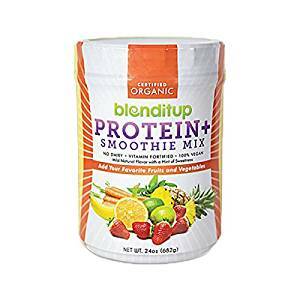 Simply add in your favorite fruits and vegetables and have a delicious smoothie any time of the day with the Pitchblende Protein and Smoothie Mix. You have undoubtedly heard of the ‘Vega’ vegan protein powders in recent years, and that’s simply because they are one of the BEST protein powders on the market. Packed to the brink with nutrients and a HUGE variety of flavors, it is quick and easy to find a vegan protein powder you’re going to adore. Some of the flavors include the basics: chocolate, vanilla, and berry; but some of the more unique (delicious) and exotic flavors include: coconut almond, vanilla chai, and natural. With only 170 calories per serving, you will end up with a huge amount of 20 grams in protein to help build and repair those muscles, 6 servings of greens made up of broccoli, kale, spirulina, and chlorella, and 50% of your daily intake of vitamins and minerals necessary to stay healthy. Oh, and of course we have to mention it includes 27% of your fiber intake as well as 1.5 grams of essential fatty acids from flax seed and hemp. Choosing this vegan protein powder means choosing flavor and nutrients you won’t mind drinking every single day of your life. Pick a flavor and get to drinking- you certainly will not forget it. 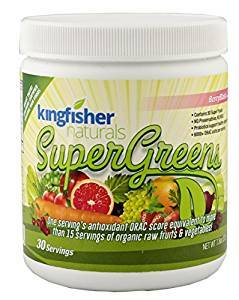 If you are looking for a vegan protein powder that is more than just a ‘protein powder’, you won’t be let down from the KingFisher Naturals SuperGreens. Seriously- ‘greens’ are some of the most important things that our bodies need, but most of us don’t get the recommended daily amount of ‘greens’ that we really, truly need. When you’re struggling to pack in enough vegetables and fruits throughout the day, it may seem impossible; well, that is where this handy and delicious powder comes into play. 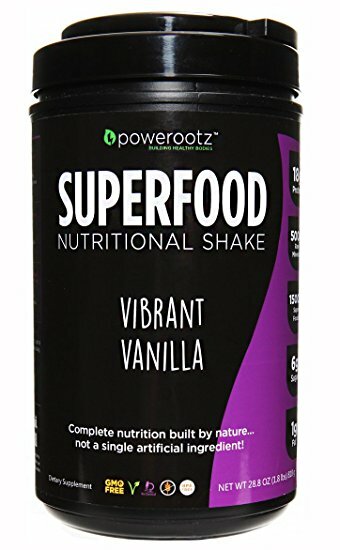 This particular powder is loaded to the top with over 15 servings of vital organic raw fruits and vegetables. This means you are getting a huge amount of 50 energy-packed whole foods in just one scoop. It’s easy to use and you’ll be getting all the enzymes, fiber, probiotics, vitamins, and minerals you could possibly dream of with just a simple drink every single day. Add some serious nutrients to your life and make your body happy than it has ever been by simply tossing in this ‘greens’ protein powder to your favorite drink or smoothie; what a cinch! 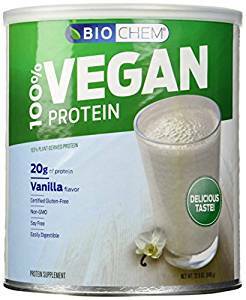 You could certainly refer to the Biochem Sports Vegan Protein as a ‘basic’ vegan protein meal replacement powder, but although it is somewhat on the traditional side, it doesn’t mean it isn’t AMAZING. Biochem has been in the business for over 15 years and they definitely have a customer base that wouldn’t change their powder for the world; and if that doesn’t tell you all you need to know, perhaps knowing the ingredients in this protein powder will. Inside this handy vegan meal replacement powder you will find a protein blend consisting of nothing but pea protein, organic hemp seed protein, and cranberry seed protein. 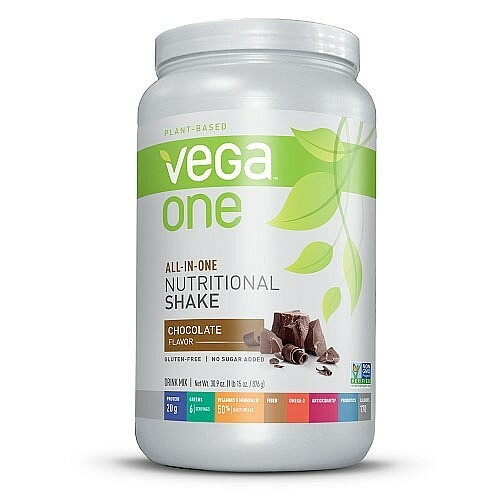 Combined with medium chain triglycerides from coconut oil, this is definitely a must for the men and women out there that want a great tasting shake that will fuel their bodies after an intense workout. There is no ‘fluff’ or cuteness here. All you get with this amazing protein powder is pure protein from all natural sources. There’s no soy or nasty ingredients found inside this powder, so you know you’re fueling your body only with the best. Twenty grams of protein and only 110 calories, it’s a great choice for the athletes out there who need to feed their muscles and help them recover and build up. I’m going to tell you this before I go any further discussing it: I LOVE this particular vegan meal replacement protein powder and will never try anything else. 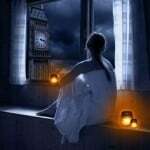 I seriously love it. You can’t go wrong with this product. 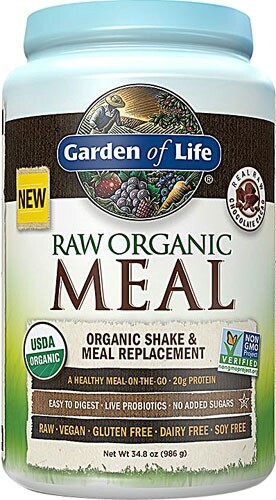 But you’re probably wondering why I am so obsessed with the Garden of Life RAW Organic Shake and Meal Replacement protein powder. This protein powder is seriously DELICIOUS, whether you’re opting for the chocolate or vanilla (and both are equally good, so it depends on your particular taste preferences!). And as I have tried a ton of different yucky powders, it was definitely refreshing to taste something decent- especially when blended with almond milk and a banana for a quick meal or snack. But aside from the delicious taste, there’s another reason to instantly fall in love with this protein powder: there is a ridiculous amount of amazing superfoods packed inside. Seriously. Take a glance at the ingredients found inside of this protein powder. You will be OVERWHELMED by the huge amount of amazing foods found inside, from organic fruits and vegetables like asparagus, cherries, red cabbage, alfalfa juice, and spirulina, to a fiber blend of flax and chia. I could go on and on about this product, but the best thing to do is look for yourself. Take a glance at the ingredients and you will be ASTONISHED. It’s an amazing superfood powerhouse that will completely transform your body and health.